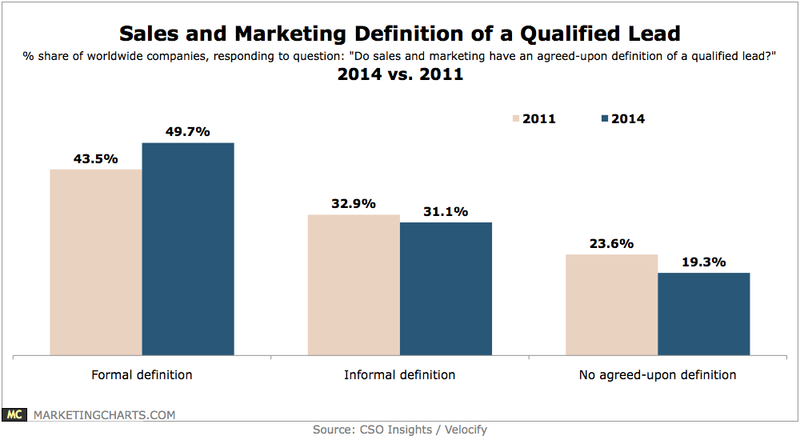 A key cause of ongoing turbulence is found in a discrepancy between sales and marketing as to what constitutes a “qualified lead”. Indeed, one of the most critical phases of the buyer’s journey comes in the moment that a prospect is passed on from marketing to sales. And yet, a 2014 study by CSO Insights found that less than 1 in 2 companies have an agreed-upon definition of what a “sales-ready lead” actually is. As you can see from the chart, the percentage hadn’t shifted much in the three years prior to the study, and I have to say from my own experience that I don’t believe it has shifted very much more since then. One crucial definition seems such a simple thing to get right, but many companies still struggle with it – to their own detriment. 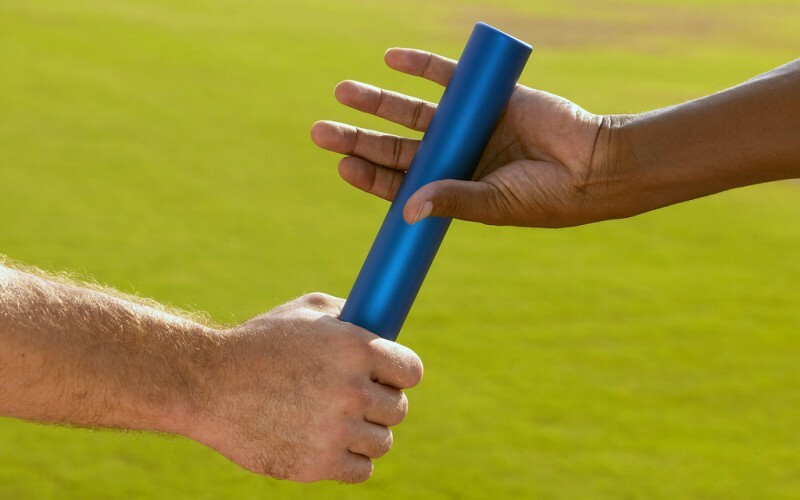 The lack of an agreed-upon, coherent language that is understood by all in a company is just one barrier that is created when sales and marketing are not working as one team with one vision. There are many others, but they all boil down in the end to miscommunications, which result in a frustrated workforce, and, ultimately, loss of revenue. In my previous post – ‘Why Sales and Marketing Should Be One Team with One Vision’ – I’ve listed a number of solutions that companies can begin to integrate into their operations to get sales and marketing working together as one coherent unit, as opposed to a divided squad at perpetual loggerheads. I implore you to read it, for in this post I want to give you 10 reasons why sales and marketing work better together. When sales and marketing are merged, the marketing team will very quickly get a better grasp on the actual buying process of prospects. It’s a common scenario when sales and marketing begin working together to find that marketing had indeed previously been handing over leads prematurely. When you get your whole team in the same room, sitting next to each other and communicating together, your marketing division will quickly learn the difficulties that sales teams face with inadequately prepped leads, and together they can adjust lead nurturing strategies accordingly. Sales associates spend all of their time interacting one-on-one with customers – but marketers rarely, if ever, get the chance to do so. Sales, therefore, have better insights into the needs and difficulties that customers face. When sales and marketing are aligned, marketing will gain a better understanding of these issues, and can begin to tailor strategies and create content that combats them much earlier in sales funnel, thusly creating more sales-ready leads quicker and more efficiently. When marketing and sales are divided and there is no set definition of a “qualified lead”, sales tend to sift through potential prospects themselves, naturally jumping on the hottest leads and discarding the rest (or at least put them on the back burner). Rather than being completely abandoned to competitors, when sales and marketing are teamed up, these cold leads can be identified and retargeted with a specialised marketing campaign to draw them back once again. Marketing will never get the chance to truly evaluate how effective their messages are when the team is kept separate from sales. Sales teams know when, for instance, a customer has received too many promotional emails from the marketing division, for when sales try to reach out with follow-up emails they find that the company’s email has been blocked. This is crucial feedback that marketing needs to adjust its practices, and just one example of many frustrations that can build over time. Sales will know when a lead is going cold. It may be necessary, therefore, to strike with a last minute offer or discount to seal the deal. This, of course, is the marketing department’s responsibility – especially if you want to release the deal indirectly via social media. When the team is working together in harmony, the perfect message can be sent out at the perfect moment, and a conversion made which would have otherwise been lost. During the final decision-making process, it’s very natural for a prospect to have lots of questions about their potential investment. Indeed, it may be the case that a number of prospects are airing similar concerns. At this point, sales can reach out to marketing to organise a web-based Q&A session to remove any ambiguities over pricing guidelines, future support for customers, or any other concerns that may be halting the conversion process. When there’s a conversion in the air, a prospect can never have too much reassurance that they are about to make a valuable investment. When marketing and sales are working together, the timing of important messages can be refined to great effect. Marketing, for instance, can start promoting customer testimonials, or re-post a successful case study on social media and ensure that it falls before the prospect’s eyes, providing that extra nudge they may need to squeeze through the bottom of the sales funnel. When sales are talking with a prospect, they may often need access to some of the material that marketing had produced. However, a study has found that 65% of salespeople say they cannot find the relevant material they need to pass on to prospects. Despite this representing the most common complaint that sales teams have, it is just simply unprofessional and embarrassing when a prospect asks for material which can’t be located. When teams work together, all materials are readily available, or, at the very least, a relevant person can be on hand to help sales find what they need. It should go without saying that turbulence within a company does not deliver the most favourable results. An “us-against-them” culture ultimately damages your bottom line. Creating a single team with the same vision, all working together in the same room, getting to know each other personally as well as professionally, naturally promotes cohesion. And happy employees are always productive employees. Here is the main reason that sales and marketing work better together – they achieve superior results. All of the above reasons boil down to this important point – one team with one vision can work together in greater harmony that will create more leads, more conversions and, ultimately, increase your company’s turnover. These are the reasons that sales and marketing work better together – but deploying the strategies to make it work may require some considerable reorganisation. Here at Cope Sales and Marketing we have the solutions that will help you merge your departments quickly and seamlessly, and ultimately improve your operations. Please browse our website – www.cope-salesandmarketing.com – to find out which of our services could help you. And please do not hesitate to reach out to us via our Contact Page – let’s start a conversation that will benefit your future growth.